Although the planet-hunting Kepler spacecraft has stopped looking for planets due to hardware failure, discoveries continue as the Kepler team sifts through the four years of data of thousands upon thousands of transits of stars. Kepler looked at over 150,000 stars in the direction of the contellation Cygnus, the Swan. Of all those over 150,000 stars, a few thousand of them should have their orbits aligned just right with our vantage point on Earth to have their planets go in front of the star and block some of the light of the star. When an exoplanet crosses in front of its star and blocks part of its light, that is called a "transit", and the amount of the starlight that is blocked depends on the size of the exoplanet. A larger exoplanet will block more of the starlight than a smaller exoplanet. We can determine the size of the exoplanet from how much of the star's light is blocked. If you make a plot of the star's brightness over time, you would see the star's brightness make a tell-tale dip in brightness that might last up to several hours as the exoplanet transits its star. Kepler did find many thousands of possible exoplanets called "planet candidates" that will have to be independently verified. The usual method of verification of an exoplanet involves checking to see if the exoplanet candidate causes the star to wobble about the center-of-mass, a sort of gravitational pivot point between the star and the exoplanet. The star and the exoplanet orbit each orbit that center-of-mass point, with the more massive star orbiting proportionally closer to the pivot point than the less massive exoplanet. A more massive exoplanet will create a larger wobble of its star. If the star wobble is too large, then it is likely that the previously undetected companion is a small star instead of an exoplanet. The verification process also involves checking to see if the star brightness dips we see are the result of another regular binary star system in so close to the same direction as the star Kepler was focussed upon, that the binary's light is blended with the Kepler star. The verification process uses monster ground-based telescopes like the Keck Telescopes on the summit of Mauna Kea, Hawaii and observing those stars with planet candidates for many weeks to many months. So things stood until several weeks ago. At the end of February, the Kepler team announced a huge set of an additional 715 verified exoplanets using a new technique called "multiplicity" that focuses on systems with at least two transiting exoplanets. Looking at the previously verified exoplanet systems that had multiple planets orbiting a given star, they found that the process used to come up with exoplanet candidates was especially reliable. Those multiple-planet candidate systems had a higher chance of eventually being verified as bona-fide planets than the single-planet candidate systems. Although the vetting process for determining which transits are probably exoplanets in single-planet systems is very good with less than 10% being something else instead of an exoplanet, the vetting process for multi-planet systems is really, really good. Better than 99% of the multi-planet candidate systems are going to be bona-fide exoplanets. That's good enough statistics to add "multiplicity" to our toolbag of exoplanet verification techniques. A couple of days before my previous column appeared in print, the Kepler team announced the discovery an exoplanet just 10% larger than the Earth in the habitable zone of a star called Kepler-186. Since I have to submit my column many days in advance of when it is printed, this column is the soonest I get to write about it. You know, it sure would be nice if the Kepler team checked my column's publication schedule so I can talk about a discovery right after it's announced. Oh well! The goal of the Kepler mission is to find Earth-sized exoplanets in their stars' habitable zones. The habitable zone is the region around a star where the temperature on the surface of a planet would be nice enough for liquid water to exist; not too hot that the water vaporizes and not cold that the water freezes. Eighteen verified exoplanets have been found residing in the habitable zones of their stars and Kepler has found half of them. The other half have been found using the star wobble technique described above. The big deal about the Kepler-186 system is that the fifth exoplanet in the system, Kepler-186f, is the smallest one found in the habitable zone of a star. At less than 10% larger than the Earth, it beats the previous record-holder for smallest habitable zone exoplanet, Kepler-62f that is 40% larger than the Earth. The mass of Kepler-186f has not been measured yet, so we don't know its density, and, therefore, its composition but such a small planet is very likely a rocky planet like the Earth, Venus, and Mars. The Kepler-186 planets were verified using the original verification technique instead of "multiplicity". The star Kepler-186, about 500 light years from Earth, is cooler than the Sun and about half the Sun's mass, so Kepler-186's habitable zone is smaller and closer to the star than the Sun's habitable zone. The outer boundary of Kepler-186's habitable zone is slightly farther than the distance that Mercury is from the Sun. Kepler-186f orbits near that outer boundary of the habitable zone, so it takes 130 days to orbit the star and it receives about one-third the energy that Earth receives from the Sun. The other four planets of the Kepler-186 system orbit much closer to their star and would be too hot to be habitable. While the energy Kepler-186f receives from its star is more like what Mars receives from the Sun, Kepler-186f could be much more habitable than is Mars now because Kepler-186f is much larger than Mars. A rocky planet the size of Kepler-186f would have enough gravity to hang on to its atmosphere for the long haul. An atmosphere would shield any life on the surface from nasty cosmic radiation. Also, a thick enough atmosphere could provide the energy-trapping of the greenhouse effect needed to warm the planet. In a previous column, I noted that without any greenhouse heating, the Earth would be totally frozen over, so some greenhouse heating is needed. However, too much greenhouse heating can make an inhabitable world like Venus (or one too warm to support our current 7 billion population that will be 9 billion in just 35 years). A rocky planet the size of Kepler-186f would also be large enough to have retained enough internal heat for it to be geologically active. A geologically-active world the size of Kepler-186f could have something like plate tectonics occuring on it. Although, we in California are very aware of the negative impacts of plate tectonics when it causes earthquakes, plate tectonics plays a key role in the long-term habitability of a planet. The Earth has a negative feedback loop process called the carbon dioxide cycle that works to dampen any long-term changes in the surface temperature. It works to decrease the greenhouse effect if the surface warms too much and to increase the greenhouse effect if the surface cools too much. However, this process works over geological timescales (thousands upon thousands to millions of years). Plate tectonics plays a key role by transporting carbonates in the Earth's crust to subduction zones and creating high mountain ranges. At a subduction zone, one part of the crust slides underneath another part of the crust. As the rock in the descending piece heats up, the carbonates can turn to gas and be released to the atmosphere as carbon dioxide from volcanoes. The Cascade volcano range north of us (Mt Shasta, Mt Lassen, Mt Hood, Mt Rainier, Mt St Helens, etc.) is one example of what subduction of plate tectonics can do. Plate tectonics also raises up mountain ranges. One geologist has said that nature "hates mountains", so nature starts eroding and wearing them down right away. The net result of the weathering process as far as carbon dioxide is concerned is to remove carbon dioxide from the atmosphere by the making of carbonates such as limestone from the carbon dioxide dissolved in rainwater combining with minerals from those mountains. The current cycle of ice ages with short interglacial warm periods began with the rising of the Himilayas from the collision of the Indian sub-continent into the rest of Asia. The carbon dioxide cycle has shorter timescale pieces too and the Orbiting Carbon Observatory 2 will study those parts starting in July if all goes well with the launch. To find out more about the carbon dioxide cycle, check out the Earth section in the solar system chapter of my Astronomy Notes site at www.astronomynotes.com . Well, you probably got more geology than you bargained for but all this is to say that planet size matters. Something the size of Kepler-186f could easily be quite comfortable despite getting only one-third the energy from its star that the Earth gets from the Sun. How about some astronomy that doesn't require a fancy spacecraft or a monster telescope catching the feeble light from some far off star? 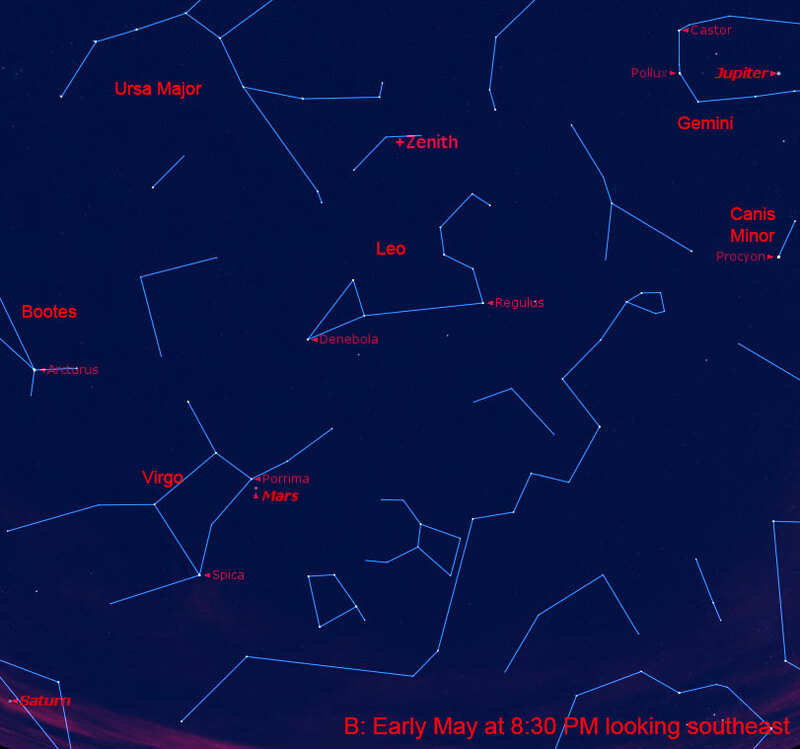 The mornings of early May will bring the Eta-Aquariid meteor shower. It should peak around midnight of the night of May5th/6th. A meteor shower results from the Earth plowing through the dust tail left behind by a comet when it nears the Sun. The dust grains are the size of sand grains or smaller. They hit the upper parts of the atmosphere far faster than a speeding bullet and burn up many tens of miles above the surface. The Eta-Aquariids are from Comet Halley. Although there can be up to 45 meteors per hour for this shower, most of them will be very faint, so this shower is considered a weak shower with just up to 20 meteors per hour that can be easily seen by those under dark skies. People in the southern hemisphere will have the better view because the shower's radiant in Aquarius (where the meteors in the meteor shower will appear to come from) will still be fairly low in the sky when dawn arrives. On the night of May 5th/6th, the Moon will be one-day shy of First Quarter, so it will set before the peak of the shower. In the next column I'll talk about a possible impressive meteor shower (maybe "meteor storm"?) that could happen the morning of May 24th from a recently-discovered comet. By 5:00 AM, the radiant of the Eta Aquariids will be about a third of the way up in the east. 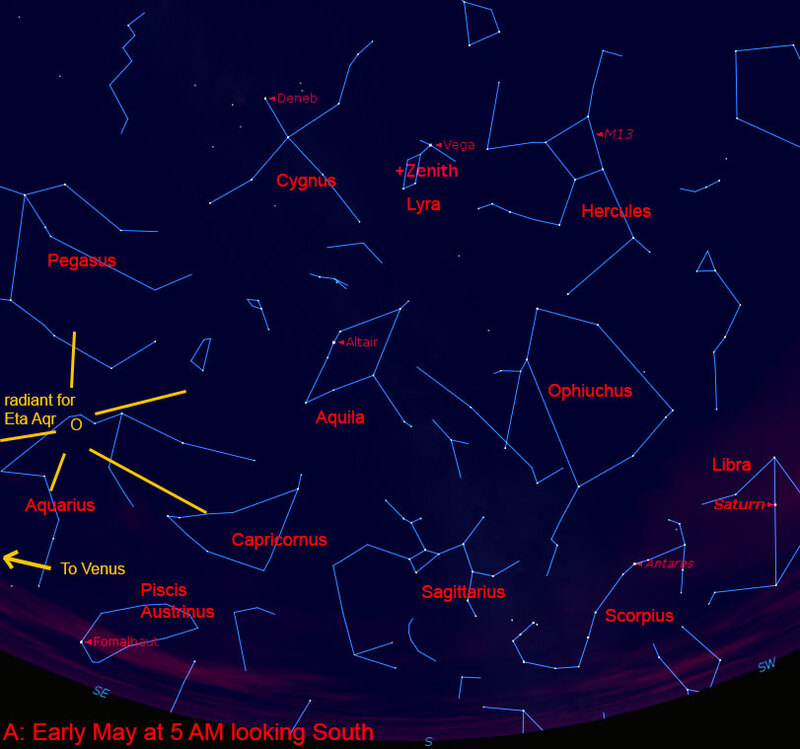 The first star chart below shows the sky for early May at that time facing south. The radiant of the Eta Aquariids will be in Aquarius to the left in the southeast below the head of Pegasus. Further down just above the southeast horizon you might be able to spot the bright star Fomalhaut depending on how close you are to the mountains. Fomalhaut is the first star we were able to directly image a planet orbiting it in ordinary visible light (instead of the usual infrared wavelengths for the other directly-imaged exoplanets). Almost due east will be the very bright Venus below the Great Square part of Pegasus. Due south at 5 AM will be the Teapot part of Sagittarius and to the right of it will be Scorpius. Continue further to the right and you'll spot bright Saturn among the stars of Libra. Unfortunately, Venus and Saturn are far enough apart on the sky that I had to choose which one I would include in the star chart with the radiant of the Eta Aquariids. Saturn won but I don't think you'll have any trouble spotting which bright star is Venus. It will the brightest thing you see in the east before the Sun rises. We will be passing by Saturn in the first part of May. It is opposite the Sun on our sky on May 10th ("at opposition"), so it is rising as the Sun is setting and setting at sunrise. We are closest to Saturn at or near opposition and the orientation of its rings are now such that they are about as opened up as they ever are, so this month Saturn will be at its brightest. Earlier in the evening, Jupiter blazes away in the west-southwest just after sunset. Jupiter continues inching toward the left twin Pollux of Gemini. Tonight the Waxing Crescent Moon will be below Jupiter. Mars will already be up in southeast when the sky gets dark enough to see some stars. Mars is right below the double-star Porrima in Virgo. A Waxing Gibbous Moon will be next to Mars on May 10th. Perhaps by then the Curiosity rover on Mars will have drilled into a sandstone rock called "Windjana". The rock will help the Mars Science Laboratory team piece together the water history of the place the rover is exploring. Between Mars and Saturn will be the bright star of Virgo, Spica. The second star chart below shows the view at 8:30 PM.